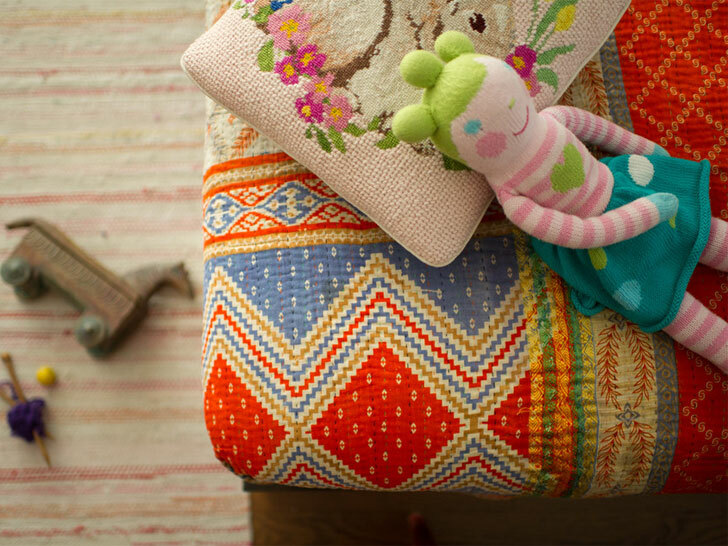 These beautiful quilts are not only exquisite fabrics, but they have a social conscience. Hand & Cloth is a fantastic social enterprise that helps local women in Bangladesh who have been victims or are at risk of human trafficking. These women sew the quilts using a traditional embroidery technique called “kantha”. The two-sided kantha blankets are made from reclaimed sari cloth, and according to Hand & Cloth have been a quiet form of self-expression for women in Bangladesh for centuries. Hand & Cloth was founded in 2007 with the aim of forming partnerships to help support women in Bangladesh. And now, six years on, the firm has partnered with Basha Boutique to provide them with the skills they need to become leaders and entrepreneurs. These women, says Hand & Cloth, are textile enthusiasts. By working with them to produce handmade textiles they have been able to offer “dignified work to vulnerable women”. Where can we buy these? Basha Boutique? These beautiful quilts are not only exquisite fabrics, but they have a social conscience. Hand & Cloth is a fantastic social enterprise that helps local women in Bangladesh who have been victims or are at risk of human trafficking. These women sew the quilts using a traditional embroidery technique called "kantha". The two-sided kantha blankets are made from reclaimed sari cloth, and according to Hand & Cloth have been a quiet form of self-expression for women in Bangladesh for centuries.